Sural presents a breathtaking landscape in the months of August and September as it's full of wild flowers and expansive grasslands. As we start from here to cross the mighty Tingloti Pass or Tingloti Gali at 4850 meters above sea level on top of mighty mountains. It's one of the toughest passes and need a proper guide. Huge avalanches fall from the mountain range across Sural. Some of these avalanches are so mighty that the rattling sound accompanying the fall breaks windows panes on the other side in the village. Entire Sural valley remains under a thick cover of snow for nearly six months. This valley is a trekkers' paradise. There is a big colourful statue of Lord Buddha and the roofs and walls are covered with exquisitely beautiful paintings. According to the monks painters from Tibet had done the decorations many decades ago. - We start early from Dalhousie by Car enroute Killar in Pangi valley, as we pass through numerous water crossings, waterfalls, snow walls, bad roads and landslides over Sach Pass. We make overnight stay in Killar. -Its an eight kilometer trek which leads us to Sural Valley, We camp here tonight. We start the trek early today and reach Sural Bhatori and then the first Adhwari, After that we cross Sural Nallah (Stream) as we cross it over a wooden bridge and climb upwards till we run into a glacier which is difficult to navigate and great caution must be adopted while crossing it. We climb upwards through thick bushes before reaching green pastures. From here a steep climb will take us to a Flatland which is our camping ground for today. Entire Sural Valley is visible from this portion among mighty snow clad peaks. 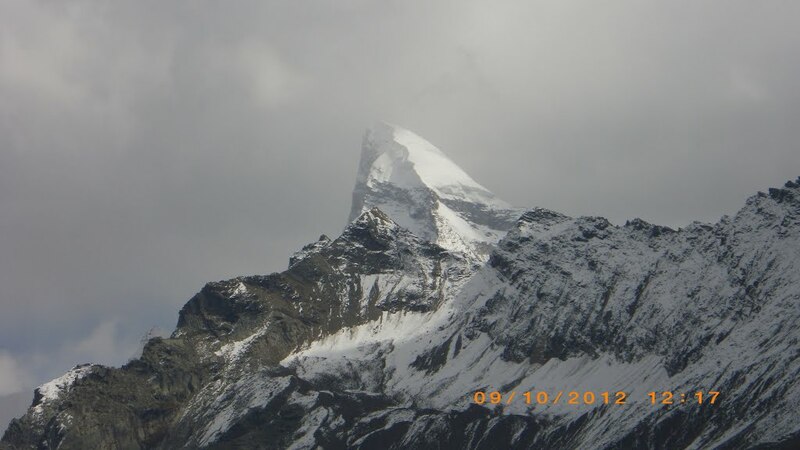 In clear weather we can see Shiva Shankar Pass. Its an exceptionally beautiful view and one should be lucky to experience it. We camp here tonight and click pictures. Today we start very early at 4 am after breakfast as it will be a very long and tiring day. The climb is very steep and risky upto the pass. We climb through boulders, snow patches and loose stones. It's a very adventurous climb as deep gorges are below and every step is taken with caution. The last 500 meter is over loose scree which keeps slipping as we climb vertically and there's nothing to hold. After crossing this patch there is snow which makes the climb easier on the last. Once we reach on top of the pass we will get to enjoy the beautiful views surrounding us. Views of entire Sural Valley and Shiva Peak and snow clad mighty mountains all around. The descent is over a moraine spread across 2 kilometers, we have to tread with caution here as it will be slippery. Once we cross the moraine we reach vast grass lands which extend for several kilometers and appear never ending. It's a beautiful walk midst these never ending grasslands until the climb becomes slippery over them, we cross these grasslands to reach our campsite Adhwari and take much needed rest. We will have a hearty meal before going to sleep after the long and exhausting journey. Today we travel on an easy and well marked trek towards Takwas. From here our jeeps would be waiting to take us back to Killar. We spend the night here and proceed towards our destination in Chamba/Keylong with feeling of satisfaction. Click here to know whats available in your package and whats you need to bring?